Nope, not channeling my inner Marie Antoinette. I actually bought a basket of heads and other body parts. 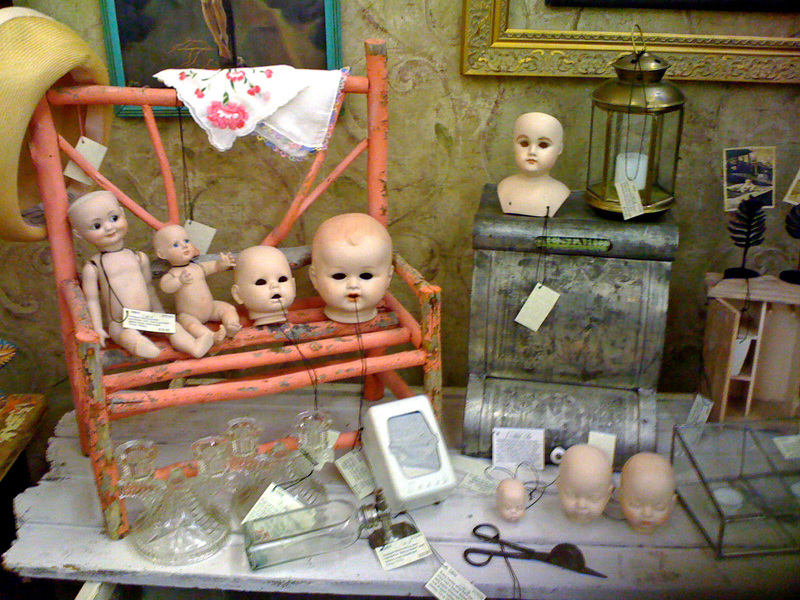 Well, actually porcelain doll heads and parts. Hit my favorite place for unique finds and came across this neat, handmade basket filled with lovely painted and doll parts and had to have it. 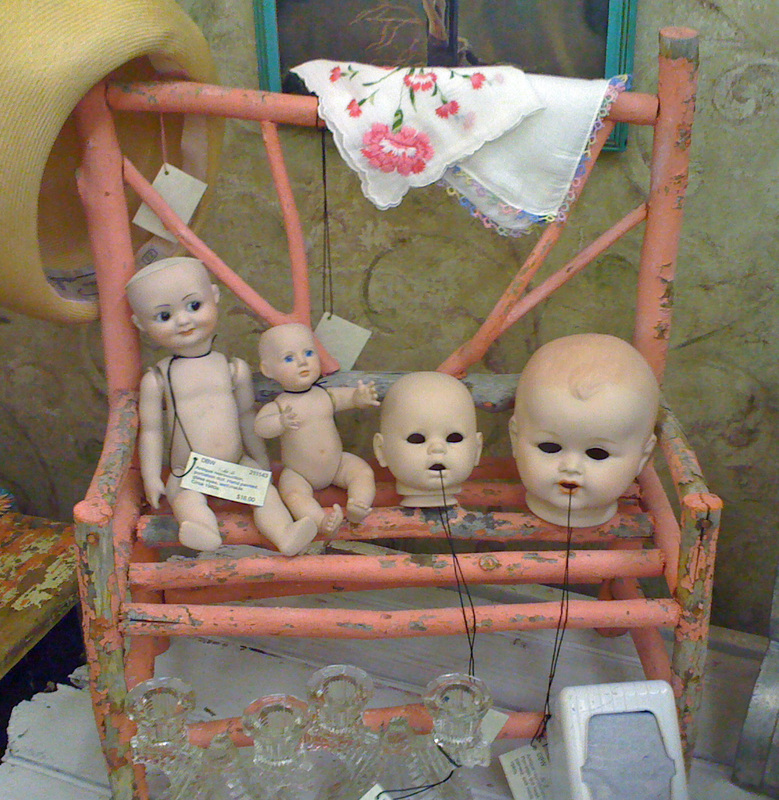 When I brought it to the counter, the folks began to laugh and said they were discussing who would buy this creepy lot...yea, it was yours truly. Still, they offer so many decorating and altered art possibilities so home with me they came. Funny how neat finds just sometimes show up in one place and the prices are so good you wonder if they even looked at what they priced. 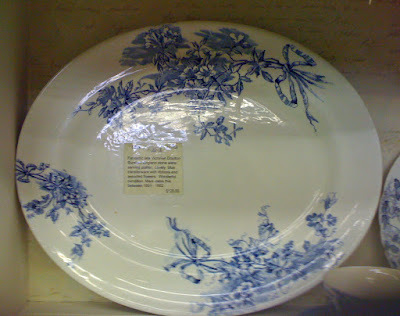 For example, this spectacular early Doulton earthenware serving platter. 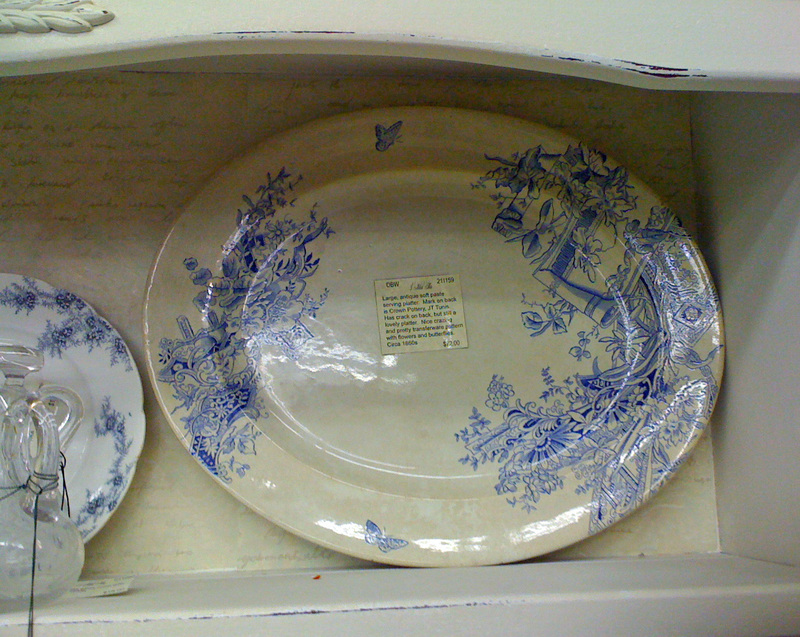 Perfect condition with a lovely blue transferware pattern. Impressed mark dates this between 1891 and 1902 and all they wanted was $9.00 for it. Be still my heart, I nearly passed out but was still lucid enough to grab it. 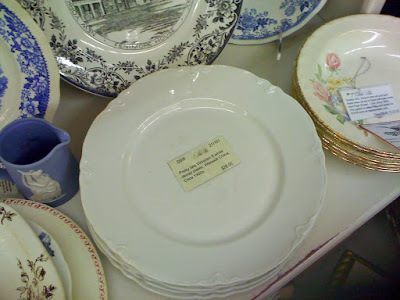 Is that another antique platter? Sure is and it is a beauty. An mid-century, Victorian platter (1860s) of blue transferware and heavy soft paste. Has an in line crack about 4 inches from one edge. These soft paste beauties rarely lasted as they are heavy and chip very easily. To find one of this age and mark in this condition is a great find and yup, another $9.00 platter. What I didn't get was they had a stack of white platters from Big Lots they had priced at $18.00 and $24.00 respectively and yet, they gave these two away. Lucky me is all I can say. I adore glass fishing floats and found three of them at $1.50 each. Two sea blue and one green. A pair of large, oval frames from the turn of the century. 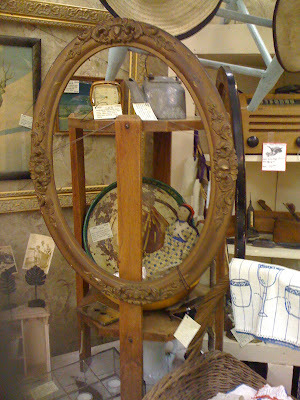 I sell vintage/antique frames as quick as I can find them. Found this great enamel kitchen table from the 1940s. Beat to hell but I adore the 4 shades of soft, chippy paint on the legs and base. Still, it is structurally strong and will make a shabby cottage collector/designer very happy. Got it on the cheap, so passing it along on the cheap. Another great find. This lovely hand painted hibiscus serving bowl has thick gold lustre slip throughout and on the sides of the bowl. Small, little chip on one curve that you can find along the left hand curve, but for $4.00, I had to have this Victorian beauty. Even with the chip, the value is around $60.00. I have it priced less than that because even the best of us have a few chips and we are invaluable. Did a complete rework of my main booth. Really stuffed it because I am leaving for Mexico this week to swim with the fishes. A head on shot of my overstuffed booth. It actually looks better "in person". Right now, this photo looks like an antique warehouse that threw up in it as I have every nook and cranny filled with something. Still, this is the time of the year when the Queen is deluged with vacationers and visitors and they all like to walk away with a small or two. Is that what I think it is? You bet it is and I have one. 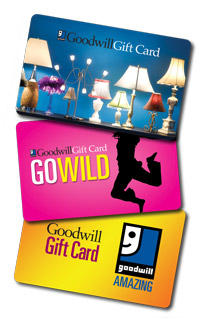 Goodwill now offers a gift card and my baby sista bought me one for my birthday and I am overjoyed. I find the best stuff at our local Goodwills so this is like the map to a treasure hunt. Can't wait to use it when I return from the deep. Ah, Lilly, you are singing my song right now. 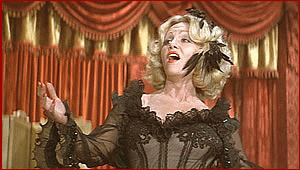 Miss Von Schtupp is a personal hero. She is a working girl that is just plain tired. I'm feeling very Von Schtuppish myself as I am burning the candles at both ends again. My "real" job is busier than ever and I'm working long hours to ensure when I leave on PTO next week that everything is covered. Still have lots of other loose ends to take care of from my two booths, to finalizing a website and just things I need to do around the house. So spent the weekend finding a little bit of treasure and then adding items to my booth. I brought in the pink Edwardian day dress. It looks great on the antique dress form. I love poppies for their bright waxy red petals but most especially because they are the symbol of Memorial Day. These lovely silk poppies look marvelous in the EAPG vase. 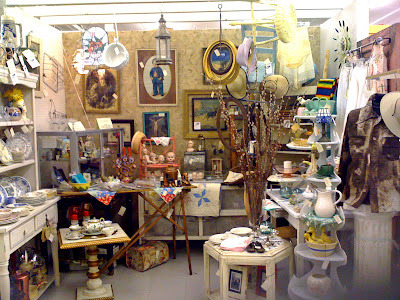 A shot of my Victorian booth filled with lots of pieces. How fantastic is this cobalt blue Edwardian hat? I love the rich blue color of the velvet and the ostrich feathers. Circa 1890s-1900s. More millinery feathers from the turn of the century. Came across a neat Moroccan looking lamp for votive candles. Perfect for your deck or patio. Also this nice, small brass lantern which also uses candlelight as its source. Let Freedom ring with these neat, dinner bells of the Liberty Bell from the 1950s. Sis saw these bags on our way out of Goodwill. Paid $3.00 each for these Vera Bradley bags. Put them in the booth on Sunday afternoon and by that evening they both sold. Split the sale with sis so she is happy too. 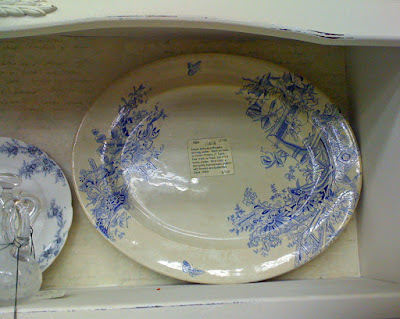 Found a few more pretty transfer ware pieces. A girl can never have enough bloomers and these whites are perfect for wearing or used in decorating. Great item from the 1890s. Came across this nifty English to Chinese dictionary from 1952. Really a fun item. And a basket full of vintage linens. These are all ready popular with my customers so I will have to get more ironed and starched to bring in. So, I'm tired. Tired of playing the game, ain't it a crying shame...God dammit, I'm exhausted. Have a wonderful week all and blessings to you and those you love. Sea Witch. 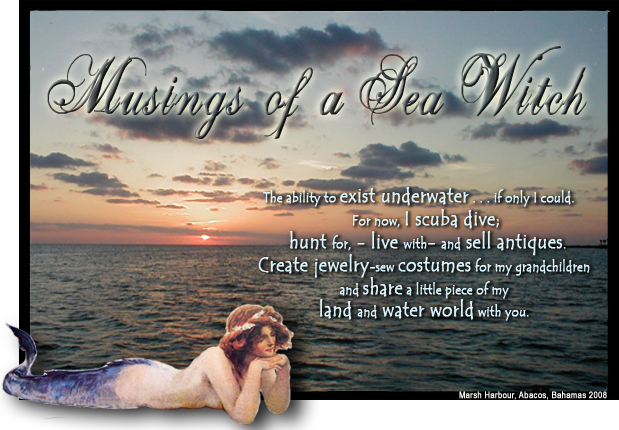 Oh yea, it's my birthday tomorrow...the sea witch will be 57. I love that number. It was a lovely Mother's day weekend and I hope all mother's out there had a good one as well. 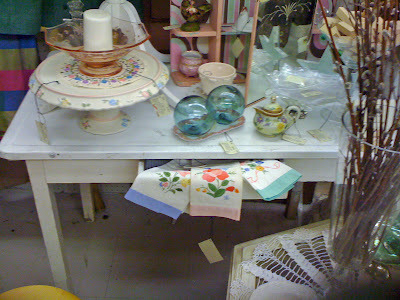 I had a little treasure run on Saturday and found another table to redo. So, Saturday afternoon I was busy refinishing two tables. Picked up this ugly brown table full of scratches and dents at Goodwill for $9.00. Removed the glass from the top and then sanded the wood. Gave it 4 coats of white paint and decided that I just didn't like the old caned matt under the glass so I punched it out. LOL. Followed the white paint with a burnt umber wash and then a final steel wool and the table is done. Not too shabby for a shabby or cottage look. I also like the open glass top so you can see into the bottom. Perfect for a pretty plant or arrangement, favorite photos or whatever you like to display. Table two. Nifty 50's table was a bright pale yellow with little brown spots and lovely "real" gold leaf trim. I sanded it down but kept the gold leaf. Painted this white as well and used the burnt umber wash again. I love the way this second table turned out as well. Perfect for an impromptu tea party. The original gold leaf really shows up nicer with the white finish too. Some of the treasures I found on my early Saturday run. A marvelous Maley, England transferware mug honoring Poor Richard (Ben Franklin) and his words of wisdom. Circa 1930s. A cool planter pipe, perfect for the Tobacciana collector and of course, the delightful Shawnee corn mixing bowl. Both from the 1940s. Purchased this a few months back and finally obtained a replacement part for the swivel. It works fantastic and I love the rich, patina shine the cherry seat has obtained from all of those musical bottoms sitting on it. I am crazy about silhouettes. These are signed and dated 1929 and are of a lovely woman named Nedaye, Asheville, North Carolina, 1929. Don't you just love the Depression era clothing and pearls and sweet bobbed hair? I found these wooden blocks with neat words for a party on them. From "cocktails" to "shower" and "save the date" and other party words and connectors, these are fun to mix and match. I have them marked three blocks for $1.00. These would be fun to pair up with scrabble tiles. Darling little Nippon lidded creamer. Lovely hand painted daisies with gold lustre trim. Another cast iron, Victorian frame. I will put an old cabinet card in that one two and take the two in next week. You know how I love Quad Plated items, and this Victorian condiment carrier (missing the condiment bottles) is perfect as a cupcake server or fill it with votives or tea lights for a pretty patio light. It was a lovely weekend and my honey had grilled steaks and camp potatoes for dinner one evening. I did a little last minute grocery shopping and I couldn't believe my eyes when I saw a 6-pack of Kalik beer at my local Krogers. Kalik is the beer of the Bahamas and seeing the bottles brought back so many wonderful memories of when we had our little sailboat their. 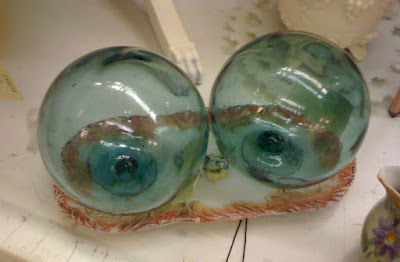 When my honey saw these cold, bad boys he grinned like a Cheshire cat. Another lovely weekend in hotlanta! Weather was fantastic...brilliant blue skies, sunny and folks digging in the dirt with trips to Home Depot, Lowes and Pike Nursery for plants. Ah, early summer in the south. Hit a bunch of yard sales on my way to a favorite haunt for treasure. Nothing but baby clothes and baby items so I found nada at the yards...but oh, what treasure I found at my haunt. Before I list what I carried home, I thought I would revisit the gold leaf frame that I literally picked out of a garbage can one night. Well it sold this weekend, I'm $38.00 richer, so I took my honey to the Bone Fish Grill for dinner. 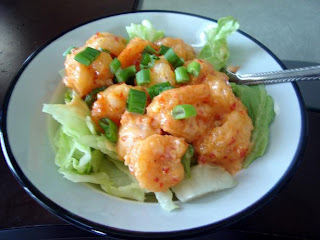 I adore their Bang Bang shrimp appetizer as a meal so I add an icy cold Cesaer salad to it and was in heaven. Crazy about that Bang Bang Shrimp! Now, on to treasure. Funny how "finds" go. I usually do not come across a lot of breakables in one trip, but this hunt was full of them. Marvelous, early carnival glass in the rich pine green color. Great lustre and in the popular funeral vase shape. My honey really likes these so I may have to keep it for a few years before I sell it. Now, the black walnut Victorian sewing table was one of my pieces. Time for it to move on to another Victorian lover. But the antique photo album full of delightful Victorian/Edwardian photos was another find this weekend. The album is filled with antique photos. It's like instant relatives for everyone. There are several pages of men dressed like women at a family gathering. Some things never change. Sold all of my glass terrariums last week and found this neat little piece. Added tiny votives to it. How pretty this would be on a patio/deck table. Great "mantique". Nice hammered copper humidor with Bakelite handles from the 1930s. I don't keep Tobacco items in the booth long. Okay, how delightful are these three ladies? Terrific head vases in nearly perfect condition. The two smaller ladies have their original Woolco labels on the bottom. The small one sold for $1.50 and the middle one sold for $3.29. I bought each for about $6.00. And here they all are, dressed up with flowers enough to make the English want hats like that. These head vases usually had those fine "plastic flowers" of the 1950-60s put in them. I just had to drop a few silk ones it to give it the same vintage look. Vintage Arithmetic tin toy. Missing the tabs on the first row that show the answers. You drop the side handle like a slot machine and the figures roll. It's a fun piece, even with this wear. Not the best photo, but this American Brilliant cut glass cruet is in excellent condition. Can you believe I got this for $6.00? I can't. Some smalls. Little green souvenir cup is marked 1918 and has the name Lewis Hill engraved on it. Pretty little white s/p shaker from the 1950s. I usually fill these with scented powder to freshen bed linens. A great 19th century candle wick trimmer. I paid less then $4.00 for the lot. Came across this piece first and I knew it was going to be a good day. 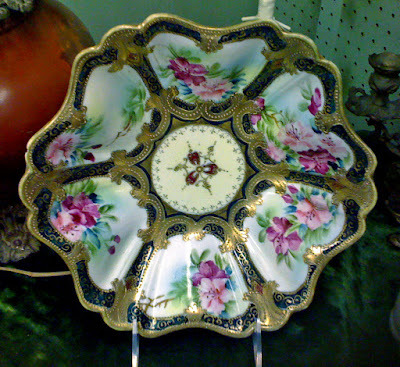 Limoges, France ladies dresser tray commemorating the Washington's Mt. Vernon Home. Love these late Victorian metal frames. Will put an old cabinet card in it. Not old, but love the look of these photo stands. Pretty little gold leaf frame will display a vintage photo too. I love old terra cotta pieces. This one has the garden of Eden theme with Adam, Eve and the serpent surrounded by the tree of life. This will burn nicely on a warm summer evening. Okay, now for the mother lode of found treasure. Yup, that is a Hummel you see. Stormy Weather with artist's signature - purchased for $10.00. Yes, two more Hummels, purchased for $5.00 each. Wait for it...no, is this real? Yes, three more Hummels also $5.00 each. OMG. pinch me. Did this really just happen? Did I just buy 6 Hummel figurines in perfect condition for a total of $35.00? Yea, I did. I still can't believe it. Yes, it was a great weekend for finding treasure. Went in on Sunday to fluff up my booth and bring in some of the new items. It's looking light and airy and sales have been good. 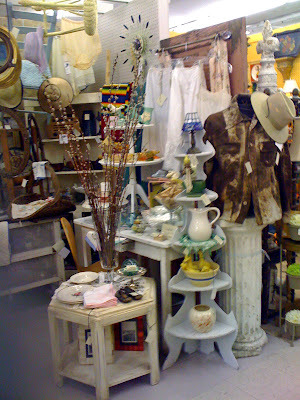 Lots of vintage hats are flying out the door along with every little terrarium and chandelier I can find.